As we all know that Nvidia is the name of most trusted and renowned brand of the tech world. 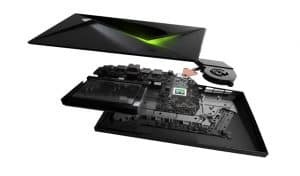 All the time Nvidia surprises us with many amazing and cool tech devices. Now they have introduced Nvidia Shield TV 2017 version which is the update of Nvidia’s first set-top streaming box that was released in 2015. 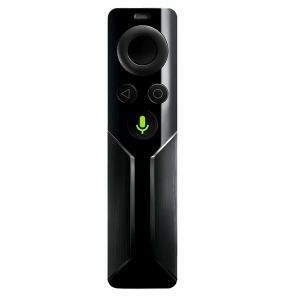 This update makes the set-top box amazingly portable with a rectangle shape, gives an incredible looking design with a built-in microphone, and it also adds a remote with the box which looks like typical remotes. Two versions of Shield TV are available in the market; the Shield TV Pro with 500GB storage and the standard Shield TV with 16GB storage. Both these versions are like its predecessor. There may arise some problem with the storage if you buy the 16GB version. But you don’t need to worry about it and you can add extra storage with its two USB ports. I’ll suggest you buy the Nvidia Shield Pro with 500GB of storage so you don’t need to be tensed about the storage problem. You can play games or watch movies without plugging any USB devices. Now let’s talk about the cool design of this Shield TV, though this box is identical to its previous one but there is a difference between its sizes. It is a little slim and tiny in size than the previous one. Many say that the box is rectangular in shape but it is not only the front and right panels are rectangular in shape and the back and left panels are trapezoids. With a matte black plastic on the top of the box and some angular lines, the box looks just incredible and eye-catching. Nvidia reshaped the design and the feel of the wireless controller than the previous Shield TV. With just 9oz. the controller is fantastic to play games. Because of its lightweight, you can play games for a long time and you won’t feel any problem by holding the controller. The gamepad looks mesmerizing with its Tron-like lines of triangles matte black plastic body. You will feel the comfort when you will take the gamepad in your own hand and it is smooth while playing games. The controller comes with traditional components such as a direction pad, two analog sticks, two pairs of shoulder buttons, and four face buttons. 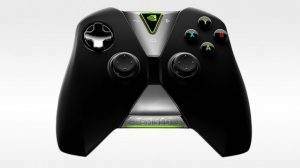 The controller also has voice search and voice control features which can be activated by a button that has Nvidia logo and the button is in the middle of the controller. At the bottom of the gamepad, there are Back, Home and Play buttons are available. You can also connect a 3.5mm headset jack at the underside of the gamepad which sits down toward the user. The controller can be used as wired also that’s why it includes a micro USB port on the top and the USB port is also used to charge the wireless controller. The microphone is the most interesting hardware that is added in this updated controller. With the help of this microphone, gamers can voice chat while playing games and Google Assistant will help the feature to complete the microphone perfectly. Like a Google Home speaker, the microphone will allow fully hands-free voice control. 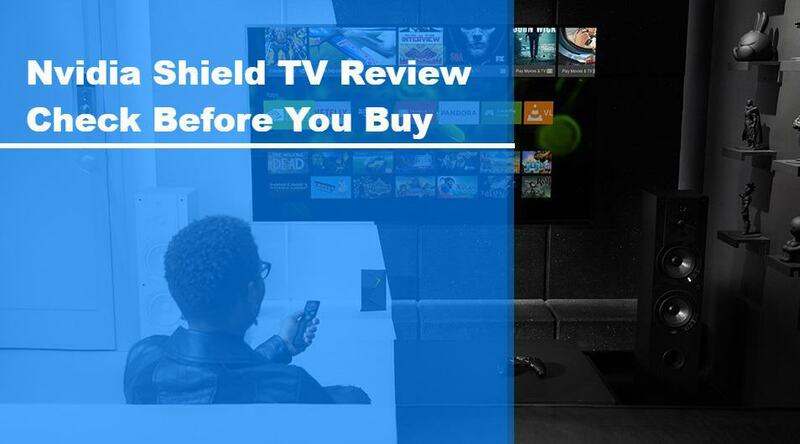 The Shield Remote was $50 in the previous version of Shield TV, but now in the updated version, it comes with the box for free of cost. Still, the price is same as the previous version. The remote is a bit larger than the previous model and it is 5.6-inch in size. But the design of this remote is likely to the previous one. With top, Back and Home buttons under it which are called four-way direction pad. There is also a big button for Voice Search below other buttons. A microphone is added to the remote but it is not hands-free as the controller mic. To use it you need to keep it near your face while you are speaking. The hardware of Nvidia Shield TV is likely to the original one. It comes with the Nvidia Tegra X1 APU which is used before in the original one. It performed incredibly while we connected some smartphones and tablets. According to some app test, the Shield TV is one of the most extreme devices in the recent market. You can have the best experience ever while watching or streaming videos with its 4k resolution. It can also offer amazing gaming performance which is likely to another gaming console. Overall its performance is more powerful and excellent than other set-top boxes out there. Surely you can have one of the best gaming experiences with this Nvidia Shield TV. There are three parts to play games with; with Tegra X1 you can play Android game, with GeForce Now you can steam online games, and with GameStream you can enjoy typical PC games. So, you can say that it is not an Android TV box it is a complete gaming console. In terms of Android gaming, till now the Shield TV is more powerful device than other devices out there. While playing games you will get a good frame rate which will help you to play games smoothly. But as we all know that Android games are not visually enriched as PC games so you can’t compare Android games graphics with PC games. But still you can play high-resolution graphical Android games with this box and it will be much more interesting to enjoy the game. By using Nvidia GameStream you can you can stream your PC games from your computer while you are on your home network. But you will need a good gaming computer that has a Nvidia GeForce graphics card. The Nvidia Shield TV box can deliver an excellent PC gaming performance and most of the PC games can be enjoyable with fast and responsive performance. You can also enjoy online games with the help of GeForce Now gaming library. Thousands of online games out there to play and you can enjoy all these games without any interruption. You can enjoy actual 4k media on this Nvidia Shield TV box. This box has this cool feature to stream 4k videos and it supports HDR videos as well. For streaming perfectly there are a variety of media apps such as Crunchyroll, Netflix, Amazon, Hulu, and Sling. You can use all these apps to stream media. It also allows you to use Google Play’s full library of video content and music. Most interesting part of this box is that it supports Google Cast with which you can stream video to it from your smartphone.